The Bed & Breakfast "La Lantana", situated on the coastal road for Villasimius, (residential area of Bellavista), in a large house with garden surrounded by greenery and silence, very close to the renowned coast leading to Villasimius, but only a short drive from Cagliari. 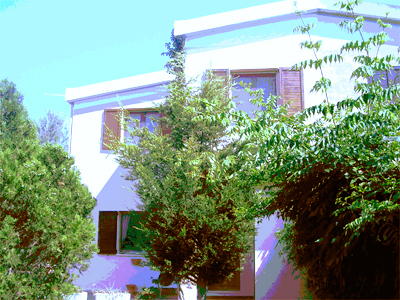 This location is ideal because it not only offers restful peace and quiet but it is also at a brief distance from the many beautiful beaches and coves which stretch from the large Cagliari beach (Poetto), with all amenities, to the smaller but picturesque and particularly beautiful localities near Villasimius. The B&B is run by a family with a true sense of hospitality and genuine welcome. There are 3 bedrooms, 2 with double bed and 1 with two single beds, each with own bathroom. We have a garden with patio and barbecue, parking place, a lounge with fireplace and satellite TV. Breakfast is served either in the breakfast room or on the patio in the garden. If you telephone or send an e-mail to lalantana@gmail.com, you will receive the confirmation straight away.